This year, Portugal was the guest of honour at the Hong Kong International Wine and Spirit Fair. I do not know much about Portuguese wines but what I know is that every single time I try one, I am hooked, spellbound, in love. And, this year, it happened again. 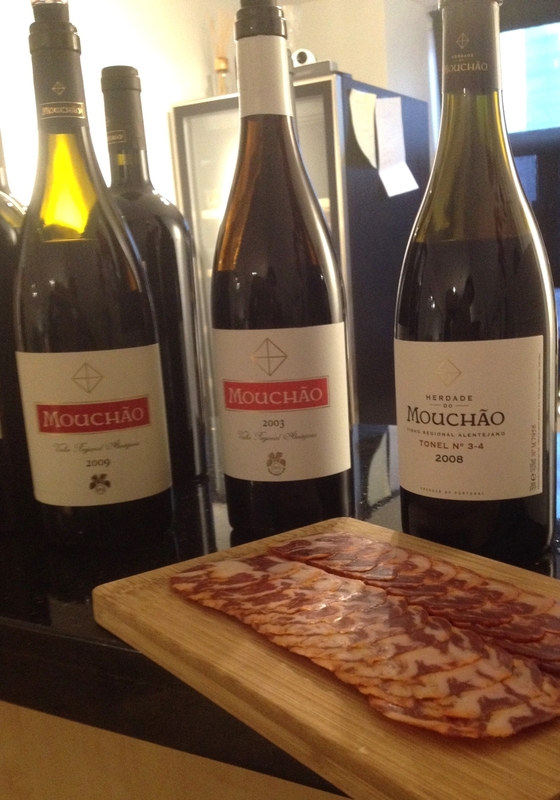 I stopped by Mouchão stand at the fair and started tasting their wines. I loved it so much that I came back for a proper tasting with David Ferreira at Adega Royale. Mouchão is located in the Alentejo [alentech’] region, in South East Portugal. Picture rolling hills dominated by cork forests and olive trees; imagine a very hot summer day and you are there, looking at an old winery built between two small rivers by John Reynolds in 1901. With its white washed walls and its traditional red-tiled roof, the adega looks like it has not changed. Today, the Herdade do Mouchão continues to be run by the descendants of the original family. They take their time when making wine, and it shows. The quality is exquisite. They mostly use a local grape variety called Alicante Bouschet (originally French) that is thriving in this hot climate and clay soils. The grapes are picked by hand and foot-trodden in traditional stone lagares. The resulting wines are stunning, renowned for their ability to mature with grace and their longevity. A wine that makes your eyes go pop because you have never smelled or tasted that before. It took me a while to pinpoint the aromas but I think I almost got it: honey, vin jaune/sherry, minerality, bread notes, quince, dried figs on the nose. Apple, grapefruit and again these yeasty and mineral notes on the palate with a long finish. Unique. Beautiful nose of freshness (eucalyptus and mint) and purity of fruits (red and black currant, black cherry). Smooth palate with fine grained tannins, black fruits mixed with fresh spices and a long finish. Perfectly well made, straight to the point, pure and refined. A new world wine made in the old world. Intense in all the sense of the word. Raspberry, sweet cherry, almost candylike, or if you prefer ‘marinated in alcohol’ like. Sweet spices as well (liquorice) and yet a touch of freshness. Definitely dry, though, with a full body, an intensity of black fruits and a very long finish. It reminded me of a dry Ruby port. The same but with age. The sweet notes are even stronger here: candied fruits, sweet spice (vanilla, cinnamon, chocolate), perfume of violet mixed with dried herbs. On the palate, the festival continues with sweet red fruits and port notes and an overlying freshness that keeps the wine vibrant and elegant with a very long finish. The flagship wine of the estate, only done in the best vintages and only 10000 bottles produced because they use Brazilian wood and they only have two barrels of it (!). Two years ageing in barrels + two years minimum ageing in bottle before release. Extraordinary complex nose of cherry combined with freshness (eucalyptus), spice (black pepper, liquorice and chocolate) and dried herbs. A surprising note of Parma ham adds dimension. Dry, smooth, high acidity and smooth tannins: all the elements for a long ageing are here, combined with black cherry, dark chocolate, figs and a freshness that lingers on the palate for a very very very long time. Ab-so-lu-te-ly gorgeous. I am very happy that Portugal was the guest of honour this year at the Hong Kong Wine Fair. I must say that Portuguese wines keep surprising me by their intensity and their quality. Over the past thirty years, Portugal has come a long way with its wines… So much so that I am starting to think that I could retire there one day and be a very happy lady drinking wine and port as the sun sets on the rolling hills of the Alentejo.